Words fall hopelessly short of our experience of colour. The coloured powder that Roger Palmer uses is non-descript, somewhere between glitterless old gold, burnt yellow and raw, rusty orange. All are part of the artificial ecology of Johannesburg, indeed the Witwatersrand Reef. They are the consequence of pulverised fool's gold, industrial cyanide and sulphur, that stains the mine dumps still visible in and around the city, dumps created from the remainder of a long physical and chemical process of producing gold. The dumps vary. 'Tailings', a sludge comprising water and finely ground rock, are the most common, squatting like vast, flattened ziggurats in the landscape. Many are eroded and pale, leached by time, wind and water. Others are darker, and look more fertile when lit by the sun. Certain grasses and reeds do grow on these mostly sterile dumps. Some hardy, stiff grasses are planted in paddies to contain the toxic dust and stop the poison from blowing across the city in August. In a sense, the dumps are the artificial deserts of the city. The dumps are now being 'rehabilitated'; that is, becoming invisible. The industrial military tinge of the language is familiar. The 'rendition' of something, usually a drawing or representation close to the thing, seems now to have taken on a more sinister meaning in a dark world. (2) Here 'rehabilitated' means being industrially re-refined to extract still more gold missed by the original pyro-chemical processes. The soil remains viable when it can yield 0.4 grams of gold per ton. (3) What's left of the leftovers often goes back down those shafts which dot the same landscape. The only sign of these in the veld is the dank plume of mist at each opening protected by sagging rusted barbed wire, replete with Apartheid era 'Danger / Gevaar / Ngozi' skull and crossbones warning signs. The mouths of these shafts are often fringed with intense green mosses and feathery ferns, producing a specific ecology at odds with the long dry grass and water-greedy eucalyptus trees around. This history is disappearing. The dumps are visible markers of wealth, venality, betrayal, and death, all now being consigned to the dark below. The many thousands of dead and mutilated labourers who sweated and bled and wept in that dust are being returned to unmarked graves in the bowels of the earth. (4) It will be hard to imagine a South Africa which is not a massive unmarked graveyard for many years to come. History interests Palmer, as is clear by his choice of figures to render in his chosen warm, raw orange powder. Four minority but powerful political leaders - all white, all Afrikaners - make up one series in Plume. All were deeply implicated, albeit unevenly, in building the racist architecture of Grand Apartheid: General Louis Botha, General Jan Christiaan Smuts, J.B.M. Hertzog and D.F. Malan. The visual sources used by the artist were part of the formal and familiar iconography of political power known to any white school pupil. Our history books were full of these images, all aesthetically and formally geared for mass-reproduction across a spectrum of the founding texts of Apartheid's so-called Christian National Education and beyond. (5) The high contrast compression of tone into line, the economy of line, the pictorial instrumentality, the ever-attendant text, make quickness of recognition and naming the most important part of reception. The homogenising codes of such image production would have mirrored the homogenising ideology they were meant to reproduce with as little noise as possible. We consumed this imagery unblinkingly, and knew it by heart. It impressed by sheer routine and repetition. Reproduction was its master. It is not only that the lines and spaces resolve into the reproducible; they are also organised into engraver's codes which add an imprimatur of age and authority to the image; and the sense of permanence is laced with threads of bland nostalgia. Perhaps originally such engravings met the taste for settler communities in an almost spiritual way, linking them to their long lost homelands; this, in spite of their dissemination and co-optation into the wider and more distant worlds in which they found themselves. This deadpan quality is in part an aspect of Palmer's aesthetic, as is a bland ironising form of mimicry. And irony is precious, like gold. One can imagine his pleasure at working imaginatively with such visually threadbare material, working with a fine-tuned visual sensitivity in no way called for by his ostensible subject. It makes demands rather on the viewer, playing with the question of 'what do you see'? Behind this is the echo of another, much more workmanlike, no-nonsense phrase: 'what you see is what you get'. So we seek visual and other events without much direction. Palmer's aesthetic feels at once deadly serious and tongue-in-cheek. Taken at face value, it operates within minimalist structures, and is insistently low-key. Yet the references these drawings touch on and point to are anything but minimal and low key. They are politically charged, querulous, troublesome and unruly. Back to some of those references: Palmer titles the series "1919-1954". The first date identifies a foundational moment in the history of modern South Africa; this was the year that the so-called Union of South Africa came into being. The last date ends the term of the first Prime Minister of Apartheid proper, D. F. Malan (1874-1959). In between these years Louis Botha (1862 -1919) served as the first Prime Minister of the Union between 1910-1919, succeeded by Jan Smuts (1870-1950) who served twice. J.B.M. Hertzog (1866-1942) followed Smuts' first term until 1928. Finally, Malan succeeded Smuts after his second term, ending in 1954. The spatial sequence Palmer presents (reading from left to right, like a text) thus follows this chronology of service. It was during Malan's term and just after that the infrastructure of Apartheid proper was most fully laid. Various notorious acts of law were passed to limit or prohibit black ownership of land, freedom of movement and expression, habitation, education, social association, and much else besides. Collectively, all contributed to the modern South African State, one characterised by an unprecedented legal and administrative system of racial segregation and discrimination which only began to end in 1994. The making of modern South Africa is a creature of the discovery of diamonds and gold. It was also the creature of war. Under Botha's Union Cabinet, Smuts was Minister of the Interior, Mines, and Defence. While Prime Minister, he became notorious for his brutal suppression of the 1922 miners' strike, so much so that Hertzog accused him of having his footprints "dripped in blood". (6) Hertzog himself was essentially a white supremacist and Minister of Justice in the Union Cabinet of 1910. His passion lay in the direction of language and culture; he lauded the advent of the Afrikaans magazine Die Brandwag (which appeared in 1910) as an "effort to escape from 'alien literary hegemony (English)'". (7) By 1942, Hertzog's views had hardened; for him the true character of National Socialism "was closely attuned to the spiritual and religious outlook of the Afrikaner nation. "(8) Clearly what he witnessed of Nazi Germany was not alien. Apartheid finally achieved supremacy of a sort - certainly racist - with the advent of D.F. Malan. This was the period of consolidation of white nationalist power, building on what had gone before. But it was not enough. The Government led by Malan and after sought out and thought up ever more Byzantine ways to control and micro-manage with increasing rigidity and invasive violence the lives of the disenfranchised mass of South Africans. His words in 1948 speak to the aspirations of a racial minority of South Africans at the time: "Today South Africa belongs to us once more. South Africa is our own for the first time since Union, and may God grant that it will always remain our own". (9) As history tells, it did not. There is something poignant in Palmer's figures. Partly it turns on how they were made: the pitching of pigmented powder at the wall, until enough sticks to produce the image. The remainder must lay dormant as conspicuous raw material on the floor. The ephemerality and fragility of the image cannot help but ironically recall the final works of Malan quoted above. Nor his own supreme indifference to very similar sentiments about belonging, moving and persisting from those he sought to effectively erase from the history of the white republic. His own words have become dust. What is disquieting is that the words of Bessie Head have, in a sense, yet to be written, even if only to suffer the same depredations of time. As it stands, the four images on the wall become lighter and lighter, shedding what they are made of. This decay stalks a similar decay of the personages in the public consciousness, for good or ill. How will we remember? The artist came upon these images in passing on a bookshelf of an artist friend some ten years ago. He kept them in the hope that they would amount to something in time. They were, as I said, dog-standard history text-book illustrations, usually derived from photographs of 'illustrious' makers of history. A. N. Boyce's Legacy of the Past comes most immediately to mind here. 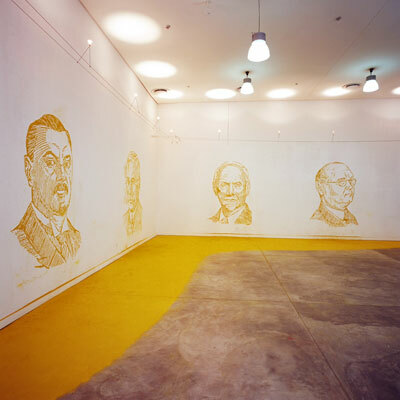 (11) The text issued by the Gallery speaks of their "fading currency as a part of South African History". Plume arises from this deluge, this theatre of historical death, like a breath of fresh air. As an exhibition it is profoundly unspectacular, absorbing in its lightness of touch and even historical whimsy. A plume could be damp or dry, thrown up by something else, something as slight as a change in air temperature. The sticking together of the pigment in the figures suggests minimal moisture, while the landscapes in the photographic works, if they look like anything, look dry, weightless. But that is an obvious observation; what is perhaps less obvious is the formal range the artist uses and is drawn to - the flat light, the diffident grey graininess, the hard edges, no edges at all. What kicks up the dust and gives an image life and shape is mostly absent. And in spite of the culture of 'the road', there is mystery and exhaustion in this absence. The overall colour register of the four busts is consistently darker than one might find on the mine dumps, as if stained by the redder colour of indigenous dust and dirt in these parts. Palmer's figures are essentially monochromatic, and one might be inclined to say one-dimensional in the coded economy of the drawing. This is drawing meant for formal simplicity, easy recognition and mass reproduction. And yet, directly experienced, the coloured marks become hyper-subtle visual traces as much as they function nominally, like a word. Both are indeed part of the artist's aesthetic - words and phenomena, often rendered in a still, hypnotically nuanced opticality. Yet there is also something distantly gestural in the gravity which keeps this material together, a counterpoint to the diffident blandness, even bleakness, of all the work. Apparently the artist lobbed quantities of powder in the direction of a stencil attached to the unmarked gallery wall. The pigmented powder stuck to the wall and to itself by its own material magnetism. Nothing is touched. The matt luminosity of the medium, its pure materiality, is all that sticks, and then only just. The entire field can be vacuumed off the wall at short notice, making the piece in one form or another resolutely site-specific. When he speaks - and he often does not - the artist sounds at ease with the fact that no actual touch is involved. One wonders whether touch has become too comfortable in contemporary art. Is it still influenced by the rhetoric of gesture that animates orthodox modernist painting? Does touch not actually defer as much as it declares? Perhaps we have still not said enough about distance and sight in the welter of words that mists up the visual world. Or perhaps the violence so deeply part of contemporary South Africa (and implicit in Euro-American modernism) has marked our sense of touch more than we want to say. It may be that distance suggests a certain order of safety and security, albeit an anxious one. We might recall here the 'exchange principle' of criminologist Edmund Locard (1877-1966), which holds that "every contact leaves a trace". Palmer's purloined portraits suggest trace without contact. Certainly they seem to aver that garrulous expressionism and immediacy of the hand we associate with the modernist cult of 'directness'. Rather, they challenge us to seek the relation between contact and trace in more serpentine and subtle ways. I am inclined here to draw an improbable line between (say) Marcel Duchamp's Dust Breeding (1920) and some kind of contaminated fallout: the dust that settles after a chemical calamity, for example. Palmer has produced a toxic history. One of the processes of refinement to extract gold from dumps involves gravity, and this is a primary force in Plume. (12) Gravity is what causes the excess powder to fall to the floor. This creates a zone of some ambiguity, where is it unclear where we should step. Going close-up to the larger than life figures, so fragile against the walls, would have us leave footprints on the fallen dust. Our tracks would be noticeable, our presence recorded, our aloof anonymity compromised. Gravity - or a counter-energy to its pull - also presumably holds the drawings together. So, some powder falls to the floor naturally, eventually creating a pool of powdery dust. The amount thrown would be important, as would the measure of moisture in the material. This art wears its considerable artistry lightly, a rare gem in these days of overblown claims and unbounded confidence. In the end, and the end must come, the expression of detachment and distance, the stiff rod of history, have produced one of the most memorably beautiful (intellectually, conceptually, materially) works I have seen in a while. The wall drawings of Plume are insistently monochromatic, but the photographs are, by contrast, wonderfully colourless. Here the grey scale (of all things) becomes the improbable instrument of delight, enchantment, magic. Low key perhaps, but delight and enchantment none-the-less. There is an abundant meagerness in the whole assemblage of the photographs, a great deal of uneventful space, with the odd moment that sharpens the edge of contrast. In one photograph, dominated by that design-atrocity that is the ostrich, the birds are shown penned in by a fence. The posts of the fence, with the strands of ubiquitous barbed wire, take on a life of their own, picking up the simple architecture and surface articulation of the long neck of this improbable bird. And what is it that these birds see in the sand? In many of the photographs the horizon line of the scene pictured is also the midline (or close) of the image-field. Grid and structure - horizontal, diagonal, vertical - are asserted as a foil for the more formless, diaphanous mist, cloud, dust; indeed, Plume plays with arrested moments. In such works shadows become substance, and we second-guess our reading of these austere patterns of light and dark. In another view we could see feather-like contact as anti-gravity, as a certain lightness of touch. On the mine dumps the feathery fronds of the reed Cortaderia agentea abound, enmeshed with 'weeping love grass' ( Eragrostis curvula ). Plumes were part of ceremonial equestrian celebrations or social triumphs of a more mundane or popular kind: dancing girl shows, parties, and the general play of the colonial classes. Of course feathers were also part of the war regalia and camouflage of indigenous freedom fighters. Yet, for all this, this art travels light, and this distinguishes it from the bulk of contemporary art from these parts. For if nothing else, guilt, obsessiveness and violence has become a value in itself; honest labour is the term. And we hang onto such terms amidst all the lies we have been told. 10 Bessie Head 'Foreword' in Sol. T. Plaatje, Native Life in South Africa , Johannesburg; Ravan Press, 1982, p.ix.